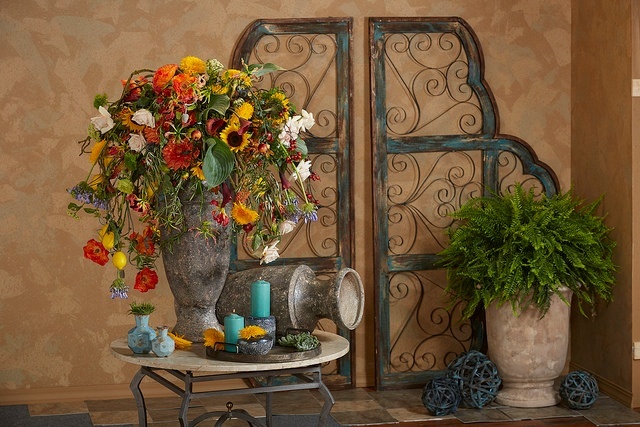 I’ve written a lot of blogs in the past about summer flowers that make amazing indoor arrangements. It is after all, my favorite time of year when it is incredibly easy to spot stunning bloomers for both indoor and outdoor purposes. Maybe your thing is sunflowers or roses? Perhaps a heaping pile of blue/green hydrangea or pink perfection peonies? Whichever way your floral boat floats, summer in New England is one of the best places in the word to design pieces compiled of beautiful wildflowers. If you are like me and love to put their green thumb to use during this season, you may have already constructed flower beds with your preference of chosen varieties. If this is the case, you’ve already probably begun clipping some of the earlier favorites such as sweet pea, helioborus or bachelor buttons that seem to be cultivated everywhere. Have you made arrangements for your dining room, living room, bathroom or bedroom already? I can attest that I sure I have! Everything around us is up and blooming here in New England with beautiful foliage and flowers popping up from the green ground! Whether we are growing our own summer beds or just enjoying someone else’s landscaping efforts, Bostonians are stopping often during their daily busy routines to embrace the beauty of summertime blossoms and the significant appeal they add to the view. Personally, I love to check out what everyone else is cultivating in their yards, particularly varieties of blossoms that can be easily cut and transferred in to the home. Making your own arrangements during this time of year can be both rewarding and therapeutic, making it a popular past time for many. Of course, there are certain blooms that are better for use in this hobby that browsers should be aware of when browsing the selection. Zinnias, hydrangeas and roses are some of the more dependable species but if you don’t see these where you live, there are plenty more to choose from. Be on the lookout for wild sweet pea, lavender, catmint, peonies, sunflowers, sedum, nasturtiums and yarrow if you don’t have issues with serious allergies. 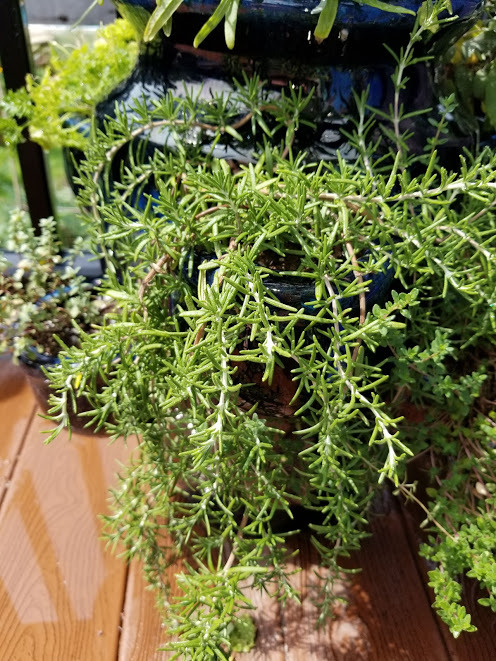 Types that may be difficult to remove along with possibly shortening their lifespan are poppies, morning glories, scabiosa and lantana so be aware of what makes a great clipping as opposed to a bad. Once you spot something you like that will withstand the procedure, grab a good pair of sharp clipping shears and snip the stem at the base. If it is attached to a larger limb, be sure not damage the existing plant so that another offshoot will grow in to replace the one you took. Small samples of flowers are perfectly okay to use in indoor arrangements but taking the base plant can end up killing the entire thing, allowing no growth to return at all. The next step is to immediately pace the summer bouquet in a clean container of warm (not hot!) water. If the vase you are using is a bit dusty and you want to give it a quick rinse before designing your flowers, be sure not to use soap that will cling to the edges. The cleanser can kill off your blooms quicker than anything, which can act like a poison to the stem. Depending on the varieties you’ve chosen, you may have to change the water frequently to avoid buildup of murky liquid-a not so pretty presentation for the flowers you’ve collected. Place in a warm to cool area that does not exceed temperatures past 70 degrees and enjoy the blooms for as long as they last! The last one is particularly important, especially if you’re trying to pick up the perfect vase of blooms for a friend. Living here in New England, there is a wide skew of preference for setting indoor temperatures, depending on both your internal comfort as well as the time of year. While many of us do just fine in our homes setting the heater on 65 degrees, others like things to be just a tad bit warmer at 70-75 degrees. Here’s where we head for some trouble… If you know the person you are gifting flowers to is habituating in conditions similar to Florida, then we need to select varieties based on that factor. Certain species have absolutely no shot at surviving in homes with heat standards hovering towards the tropics and will prove quite disappointing fairly soon after receiving the bouquet. Don’t think about calling your florist to complain either because some of the responsibility to maintain healthy blooms should fall on you. Expecting a bunch of tulips to preserve its beauty in a space with temperatures held in the 80’s in just plain ludicrous so you’ll want to do a little research before sending fleurs to a loved one in a hospital (they are notoriously sweltering hot) or to a neighbor who likes to walk around in t-shirts in the middle of the winter. Don’t lose hope though… Lucky for florists (and you), we’ve found plenty of species that are both stunning to gift as well as tough against typically undesirable locations. While roses may not be the best option in cases like these, you’ll be happy to know there are a slew of others that are just as attractive to present to a family member or friend. 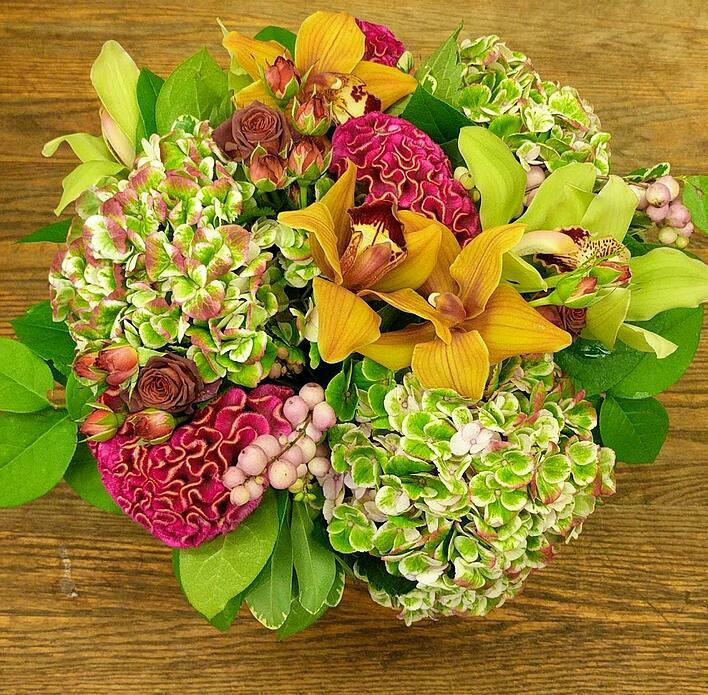 Jot down the names that appeal to you and ask a local florist about availability the next time you want to send flowers to someone with warmer weather condition preferences. 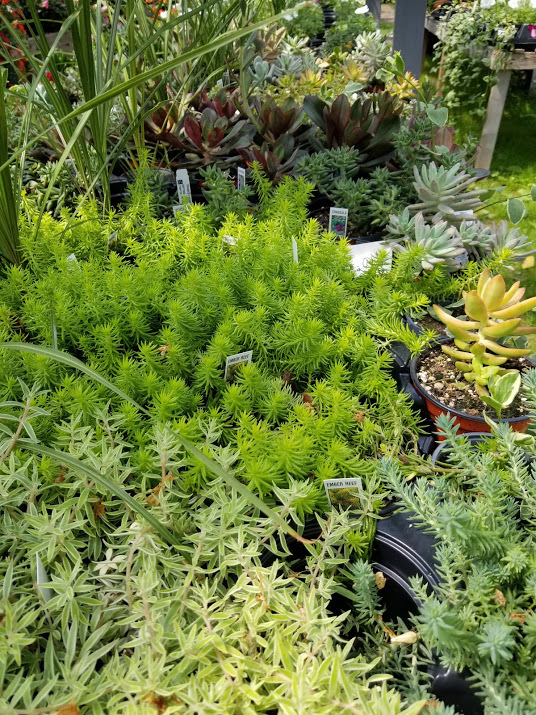 Succulents are amazing in the fact that they are grown in many, many shades of color. It is possible to find species in tones of red, orange, yellow, green, pink and purple so no matter what your preferred palette might be, there’s sure to be a plant in this family that will certainly please. They originate from arid, dry climates so they need little water to survive. Succulent jewelry making is becoming a big thing in the arts community including necklaces and bracelets. Overall, succulents are pest resistant so they won’t get “buggy” like other varieties. They will weather well indoors once winter arrives in New England. Cacti are succulents but not all succulents are cacti. The “Christmas Cactus” is an example. The salty air is beginning to waft off our coastlines and people everywhere in New England are thrilled to be dreaming of near future visits to our gorgeous beaches. For some Bostonians, they might even be lucky to own or rent a cottage on the Cape, Maine or Rhode Island in the next few months where they will enjoy the closeness in proximity to the ocean. New England summers are a treat for us locals so we tend to accentuate the season as much as possible with barbecues, pool parties and evening get togethers on the porch. Foods such as shrimp, lobster and clams are a theme for these events but other areas of party planning are equally qualified for the same sort of inspiration-namely flower arrangements. While we usually select blooms such as red berries and pine greenery for winter décor, summer time reflects a whole other field of wild blooms of a softer palette. Mimicking the motif of a beach cottage, these varieties are softer in nature with hues of pale peaches, whites, creams and blues. Top designers around the city try their best to replicate the sensation of the sea and sand within their pieces so customers will take in the “feel” of the beach even if they are remaining within their city dwellings. For me, this is my favorite time of year when blossoms represent a core attribute of peace and tranquility, especially when displayed near the oceanfront. 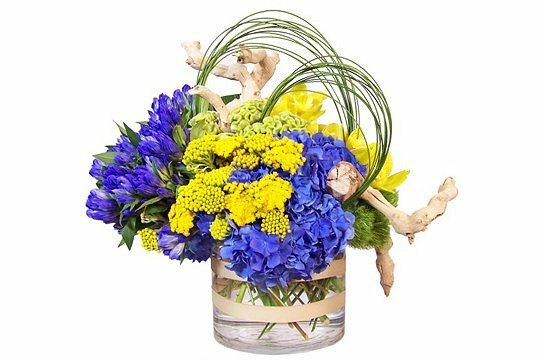 If you are anticipating a love for summer flowers reminding you of past/present days spent on the seashore, check out these “can’t miss” bouquets that envelope the meaning of beach living in New England. 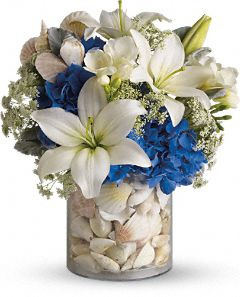 Stunning flowers to request or replicate on your own which convey a beachy feel are those that are light, airy and whimsical. This may sound like a strange description but species such as delphinium, lace flower, ranunculus, garden roses and wisteria are perfect examples of what I’m talking about. If you live by the shore, take special notice of any blooming shrubs such as hydrangea that love the salt air-they make great clipping for inserts in arrangements. Peonies are another excellent variety that goes cuckoo for a seaside habitat, particularly those that produce buds of sweet pink, cream and blush. I also like a fresh vase of stems that have been gathered from around the yard in hues of deep blues and purples. If you’re planning a summer getaway to the ocean or just enjoy the notion of the idea, treat yourself to a cottage inspired arrangement which will keep you happy throughout the warmer season! If you’re like me and have experienced this depressing moment of truth, maybe I can give you a bit of advice on how to resurrect the blissful ocean ambiance until the new season calls upon us? There are a lot of helpful tips including adding scented candles to your home, making sand terrariums, listening to wave recordings, or painting rooms in similar shades of blues and seafoam green. All of these ideas are great suggestions and are bound to help you through the snowy months of the calendar but might I suggest another coping mechanism to get you over the chilly hump? It’s summertime and parents all over New England are looking for fun activities to distract and entertain the kiddies for the next several months. Hopefully encouraging them to play outside, there are so many wonderful things to do to pass the time, many of which you can find hidden in your own backyard. If you have a child who particularly loves gardening, here’s an idea that might be perfect for you! Do you have a bed of flowers and a few old masons jars lying around that need to be repurposed? 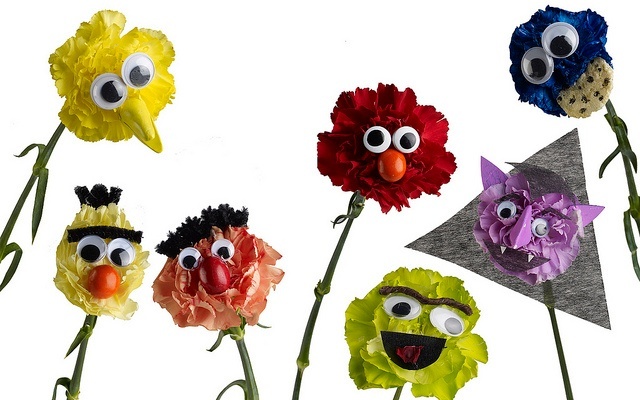 If you do, here is an excellent craft to teach your children while also bringing the beauty of summertime into your homes. 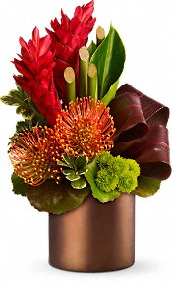 Take the cutting shears and snip off shoots that are bright in color of differentiating lengths. Depending on the child’s age, you may want him or her to do their own cuttings so you’ll want to remind them of the plants they are allowed to snip and the ones they are not. Excellent species to use for this type of arrangement are catmint, hydrangea, nasturtiums, campanula, yarrow, sunflowers, sedum, butterfly bush and lavender. Fill the masons jar with warm, temperate water (not cold) and set aside. Once you have your floral clippings ready, place one at a time in the vase, fluctuating between colors and lengths to design an attractive an interesting piece. 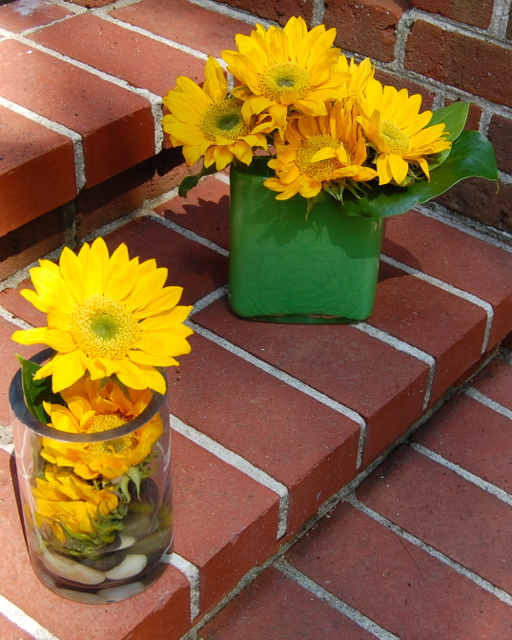 Be sure to turn the jar as you add stems to avoid off balanced bouquets and clumping. Try to only touch a flower once as well because the more times the petals are disturbed, the greater chance of bruising or breakage. Once you have filled the vase, bring the piece inside and place on your table. If you have more spare containers and an overflowing garden bed, create several others and gift to loved ones and neighbors. The summer is coming to an end and hopefully you’ve enjoyed several fun filled days enjoying the warm activities that this time of year blesses New England with. My favorite destination spot are the beaches on the north shore that never disappoint with their crystal clear waters and beautiful rocky landscape. One feature that I particularly love is the stunning blooms that grace the seashore with tranquil color and sweetened fragrance. Being a gardener myself, I have often tried to replicate this “beachy” scene within my own backyard, trying to use the same if not similar varieties accustomed to the ocean habitat. Truthfully, it’s not easy because if you’re like me who lives inland with forestry surrounding their home, it can be difficult to succeed within our compromised growing conditions. For one thing, our soil does not drain as well as sand so it’s imperative to find plants that can adapt to both potting environments. The second factor is the lack of salt in the atmosphere, which beach flowers typically thrive on. The third issue can be a lack in sunshine or direct light if your beds are hidden underneath branches or enlarged shrubbery. Although this seems like a depressing abundance of obstacles, I assure you that there are some species of flowers that will do A-okay if you can tweak your gardening regime just a bit. After some trial and error, I’ve found this list of successful bloomers that will bring the ocean essence to your backyard no matter where you live. 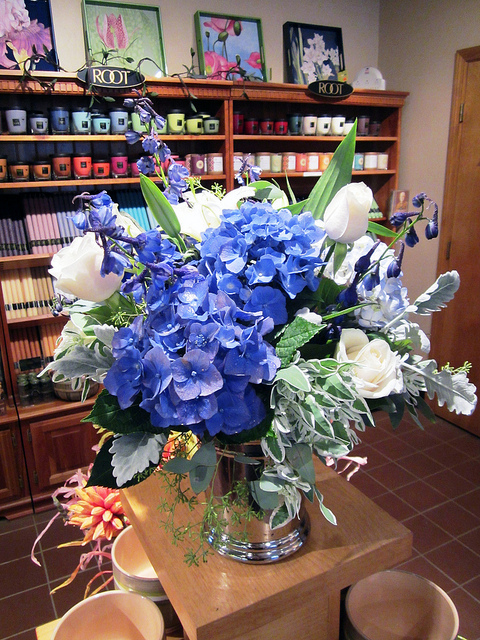 Hydrangea is one of those flowers that are always associated with the beach, particularly in shades of blue. Like many of their seafaring friends, they adore the sodium (NaCl), which makes them bloom happily well into the fall season. If you’ve visited Cape Cod or Martha’s Vineyard, you’ll no this to be true hydrangeas can also be planted in other areas, too. As long as the soil is soft and well watered, this bushy flower can flourish in yards or as part of a summer garden. Hydrangeas also prefer a little bit of shaded area so for those of us whose backyards are overgrown with trees, that’s really no problem for this variety to survive within. Beach Grass is a fairly prevalent shrub that grows along our coastline with little to no maintenance necessary. I have planted several of these bushes on my property and with the exception of watering them during dry spells; they really require little effort on my part. One tip to make them grow larger each year is to cut them at the base when October arrives to ensure a healthy return the next spring. I love these little beauties because they represent a “wildflower” appeal that can be grown not only close to the seashore but also in meadows, forests and almost anywhere else you can think of. If you have raised beds, then the soil will stay a bit warmer which they’ll thank you for during the colder winter months of the year.